Do you know how to make a healthy executive breakfast to start your business day right? Are you looking for healthy lunch ideas for work? We have compiled a list of best healthy cookbooks for executives. No matter how busy you are, you can eat healthy all week! 1. Made in the Office: Tasty And Hasty Meals With Just a Kettle, Toaster & Microwave. The aim of this cookbook for executives is to make your office meals more exciting, more sustaining, and cheaper than before. Many of the meals can be made the day you want to eat them, so no extreme fuss the night before, and no fancy tools and gadgets needed here, all the recipes use basic cooking equipment in your office kitchen. All the ingredients can be sourced from local supermarkets and used in multiple recipes so you make sure nothing goes to waste. None of the recipes take more than 15 minutes to make, so you can fit healthy eating into your schedule and still have plenty of time to savor them before you get back to work. Best of all, these recipes are a series of ideas intended to inspire your own experimentation with the ingredients you love. 2.Food That Works: Real Meals to Survive the 9 to 5. You can no longer use your busy schedule as an excuse to compromise your health. As an executive, you work hard, and you deserve fresh food; don’t settle for subpar meals whether in a restaurant or drivethru. This cookbook for executives and entrepreneurs contains recipes for fast, healthful, and portable breakfasts and lunches, perfect for those working long or unusual hours. No previous cooking knowledge needed, this book was crafted for all skill levels out of the author’s disapproval for their office lunch culture. It’s a comprehensive guidebook that includes five shopping lists and prep instructions so that no matter how busy you are, you can eat healthy all week. You’ll no longer dread going to the grocery store after reading this book, becoming a savvy shopper, and running an efficient kitchen to fuel your Monday through Friday grind! Get your eating office survival guide! 3.Mindful Chef: The No 1 Healthy Eating Book of 2017.
by Myles Hopper and Giles Humphries. Do you search for recipes based on their effects rather than their ingredients? Then search no further for this cookbook has got you covered. The recipes within this cookbook are classified by the effects they have on the executive. For energy and productivity, you could prepare blueberry and banana pancakes for breakfast. If you have a stressful work day, jerk chicken with sweetcorn and buckwheat. There are 70 dishes nutritionally proved to boost health and wellness in those areas as well as gut health and sleep. Every meal can be prepared with 10 ingredients or less, and in 30 minutes or less. There is not gluten or refined carbs or sugars either so you can eat guilt-free from breakfast to dinner. However, Mindful Chef is better if you have some cooking skills under your belt or a partner that can help you out. Get recipes for energy & productivity and many more! 4. Salad Love: Crunchy, Savory, and Filling Meals You Can Make Every Day. What started as a personal challenge, author David Bez set out to craft a new salad, at his desk, every workday. He has since developed a formula for salads, a winning formula at that. From the base to dressings, this cookbook has 260 healthy and delicious salad recipes (enough for every workday for a year) and even a section on 1,000+ days of office lunches, so variety is no issue here. What’s unique is that this cookbook is also divided into seasons, so you can match your salad to season! There may be many salad books out here, but Salad Love is praised for the design behind the recipes, and it’s not bad that the salads look like a work of art too. This cookbook is essential for any executive who cares about eating healthy, but doesn’t want that side Caesar salad every day. Take your office salad game to the next level and with a bountiful of options and be inspired to craft your own salad too. 5. Zero Belly Breakfasts: More Than 100 Recipes & Nutrition Secrets That Help Melt Pounds All Day, Every Day! by David Zinczenko and Michael Freidson. Early rising executives rejoice! There are over 100 recipes in Zero Belly Breakfasts that can help you flatten your belly regardless of your health history, lifestyle, or even your genes. The results of a 500 person test panel will inspire you and prove that you too can lose up to 16 pounds in the first 14 days. The recipes are praised for being easy to make, shop for, and of course, eat! But not just recipes, this cookbook also covers the research behind the effects of a high-protein breakfast (or lack thereof) and explains topics like how to eat specifically for weight loss without compromising on calorie intake. Add variety to your morning routine with recipes from breakfast burritos to overnight oats that can help you to enjoy all-day energy at the office. Even if you are not a morning person, there are 20 seven-minute breakfast recipes that are perfect for busy weekdays or when you’re on the go for work. 6.Breakfast Love: Perfect Little Bowls of Quick, Healthy Breakfasts. Title sound familiar? The author of Breakfast Love is also the author for Salad Love! 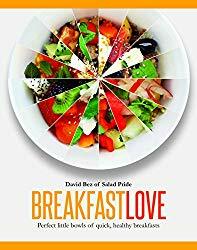 Except in this book, David Bez is giving you more than 160 bowls of healthy, speedy breakfast ideas. Easily set yourself up for a productive day at the office and energize early with these unique breakfast recipes. The simplicity of Bez’s writing style and beautiful accompanying photography makes this cookbook easy to digest from cover to cover. Not to mention the simplicity in the recipes; you’ll start with a base of grain for each bowl and build from there to include fruits and vegetables and additional toppings. With both sweet and savory ideas to try, readers enjoy the variety that Breakfast Love brings to their mornings. You can even conquer the basics with recipes for homemade granola, muesli, and dairy-free nut yogurt. The recipes are categorized from carnivore to vegetarian to preferences in-between so that you can keep your preferred diet and still fuel up each morning before the emails, meetings, and conference calls ensue. 7. Superfood Smoothies: 100 Delicious, Energizing & Nutrient-dense Recipes. What is unique about this smoothie book is how the recipes are categorized. Are you looking to improve your bone health? What about your hearth health? Other categories include beauty, detoxing, and immunity. If you are an executive that wants to cut to the chase and all the noise, then Superfood Smoothies is for you. Not only is each smoothie nutrient-rich with the world’s most antioxidant-, vitamin-, and mineral-packed foods, but it is easy to see which foods can impact your pain points. Easily search by food to make a cleansing smoothie to flush your body of toxins or a calcium-rich smoothie to strengthen your bones. Popular smoothies from Acai and Strawberry to unique smoothies like Green Tea Pear and Pineapple Watercress can add variety to what goes into your blender. Learn more about changing your eating habits on our Healthy Diet Section, with amazing books on healthy eating habits exclusively selected for busy executives. Get simple diet ideas for executives!